Peacocks is a fashion retail chain based in Cardiff, Wales. The chain is a part of the Edinburgh Woollen Mill group and employs over 6,000 people. There are currently over 400 Peacocks retail outlets located in the United Kingdom; and more than 200 stores located in twelve other countries throughout Europe. Originally selling home goods and basic clothing, Peacocks has been re-branded over the years as a value fashion store. Richard Kirk, the former owner of the chain, worked hard to transform Peacocks into a major fashion player. The retailer won numerous awards, notably the Best Value Retailer award from Drapers. 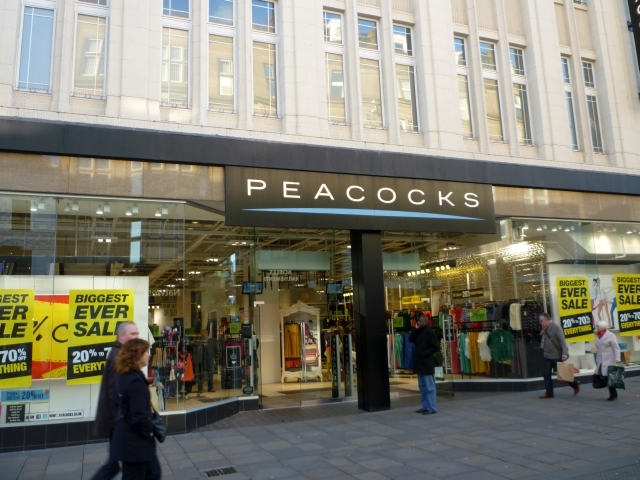 In January 2012, Peacocks entered administration and was bought by The Edinburgh Woollen Mill Group. Edinburgh Group also owns the Jane Norman chain, a fashion outlet for women. Branded as Peacocks London, Peacocks has more than 200 franchise outlets outside United Kingdom, in Bahrain, Cyprus, Egypt, Georgia, Gibraltar, Greece, Kuwait, Malta, Poland, Romania, Russia, Saudi Arabia, Serbia, Slovakia, Ukraine and United Arab Emirates.